I – Qnap Expand Capacity: How It Works? 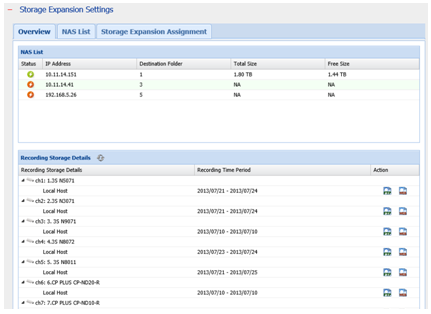 III - How to Configure Storage Expansion? 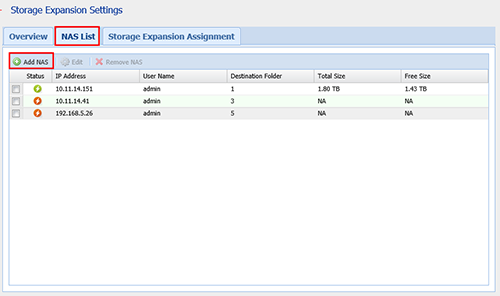 How to Configure Storage Expansion? After installing the StorageExpansion App (QPKG) on the Turbo NAS and successfully enabling the storage expansion to the Turbo NAS, the Turbo NAS will frequently ask the NVR if it has new recording files. If the NVR has new recording files and the backup buffer meets your defined threshold, the Turbo NAS will then download the recordings from the NVR. Under our testing, this method largely improves file backup throughput, with some processes offloaded to the Turbo NAS CPU. 1. Addressing user needs: Users can expand their storage capacity based on their needs. 2. Reducing expense: This is a cost-effective choice to expand storage. 3. Highly scalable for storage expansion in the future. Suppose the NVR has enough space only for storing 5 days of recording files, and the NAS has enough space only for storing 7 days of backup files. The backup buffer on the NVR is set to 48 hours. The recording files are set to be backed up to the NAS. After the settings are applied, the NAS will check and download the recording files of the earliest 48 hours from the NVR. So, recording files of the first two days will be downloaded and stored on the NAS. On the 5th day, the NVR storage space is full. To store new recording files, the NVR will delete the recording files of the first day. Now, the earliest 48 hours become the 2nd and 3rd day. So, the recording files of the 3rd day are downloaded to the NAS. 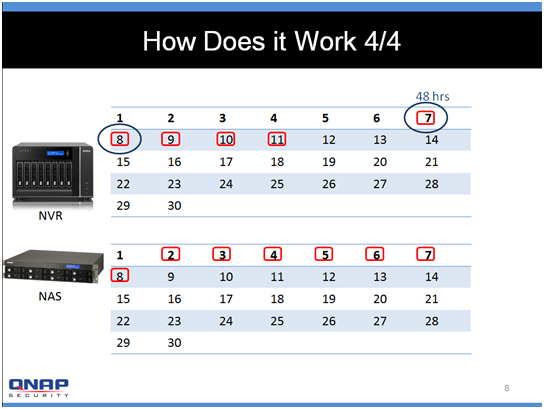 To store new recording files, the NVR will delete the recording files of the 6th day, and recording files of the 8th day (the new, earliest 48 hours) are now downloaded to the NAS. Since the storage space is full on the NAS, it will delete the recording files of the first day. The total hours of recording files = total hours of recording files on the NVR + total hours of recording files on the NAS – Backup buffer. In order to ensure that Storage Expansion can be executed during the recording process, please be advised to estimate the limitation on network throughput for specific VioStor NVR series. VS-8100 Pro+/8100U-RP Pro (+)/12100U-RP Pro (+) series: 360 Mbps. VS-2100 Pro+/4100 Pro+/6100 Pro+ series: 160 Mbps. VS-2000 Pro/4000 Pro/6000 Pro series: 90 Mbps. A gigabit switch is required for this application. 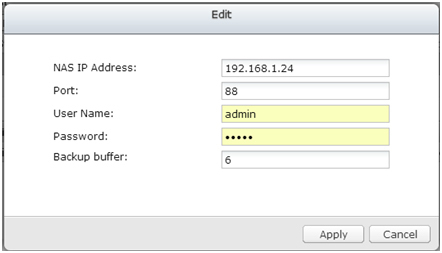 All NVR and NAS units are required to use only fixed IP addresses. Modification on storage expansion related setting is not supported on local display. 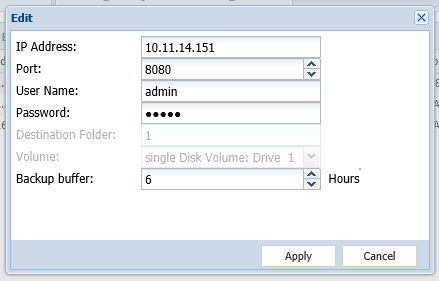 The file moving process between the NVR and NAS will be completed even if it is suddenly interrupted (for example, the destination folder is deleted) . For example, the cache count is set to six hours. The destination is changed to none in the middle of the processing. When this happens, the NVR will still move recording files to the NAS until the entire process is finished. Note: Please visit our download center to download the App (QPKG). Before installing the App (QPKG) package, please make sure the App (QPKG) is correct, read the instructions carefully, and back up all the important data on the NAS. Download and unzip the StorageExpansion package.To install the App (QPKG), please click “Browse” to select the correct App (QPKG) file and click “INSTALL”. After installation, click Launch to connect to the webpage and configure the settings. Check available NVRs on the list and their status on this page. 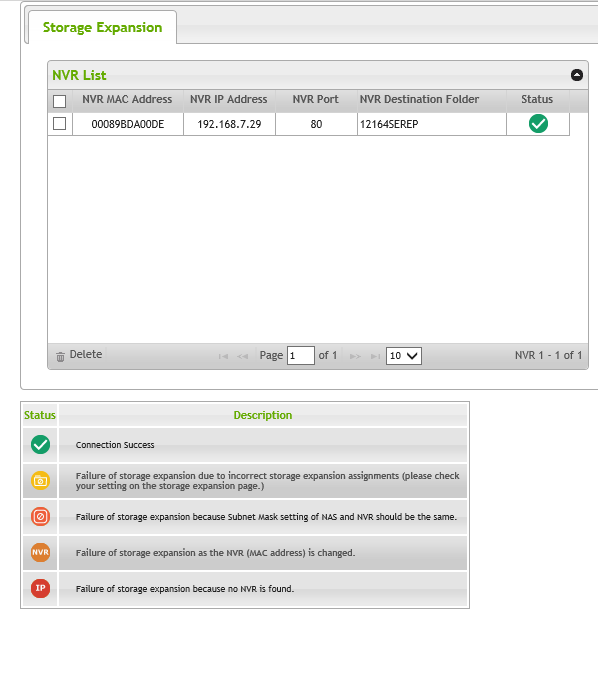 Note: The status of an NVR will become after storage expansion assignment is completed. Step2: Please make sure that the StorageExpansion App (QPKG) has been installed on the NAS and enable Storage Expansion. 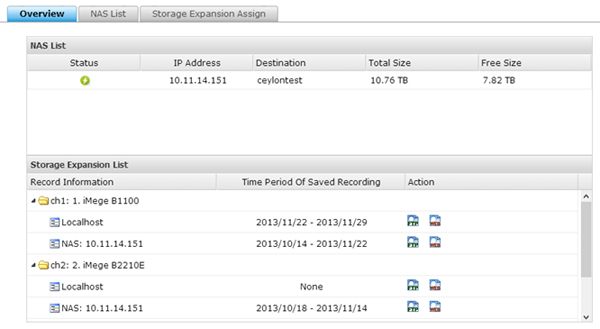 Go to “Camera Setting” → “Storage Expansion” to configure relevant settings on the page. Click “NAS List” then the “Add NAS” button. Destination Folder: The folder created on the NAS to save recording files. 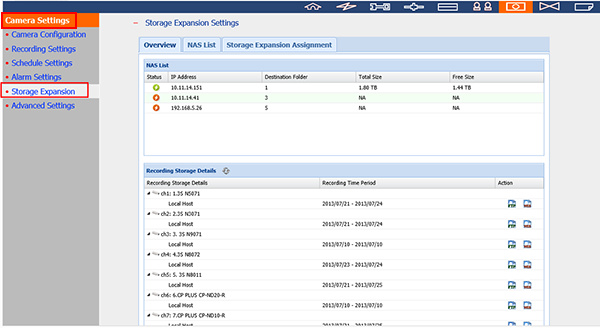 Obtain NAS volume details: The volume assigned for storage expansion. Backup buffer: The time it takes to move recording files to the NAS. The maximum value is 12. 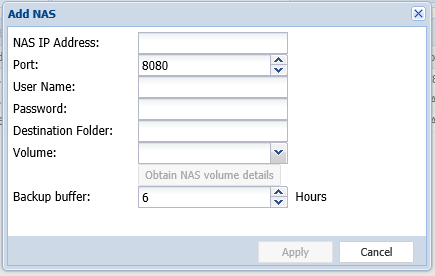 You can enable a NAS and click Edit to modify NAS settings on this page. 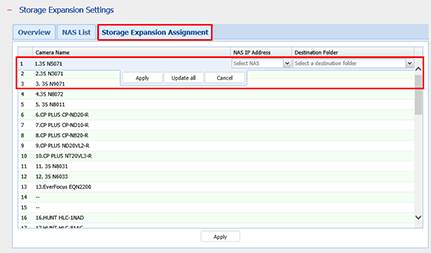 Click “Storage Expansion Assignment” to choose a NAS as the storage unit for each channel. Review all the configured settings and recording storage details under “Overview”. The page will automatically refresh the status every fifteen minutes. The various QNAP Turbo NAS models are the solution that expands on the storage capacity of the NVR to save more recording files. Integration of both QNAP devices can help users to more flexibly and efficiently save recording files.